Most people have a checklist they go through before they leave the house. Is the stove turned off? Are the doors locked? Do I have my wallet, my keys and my cellphone? The only thing that has changed about that process in the last few years has been the addition of that last item on the list. Today, 91% of Americans have cellphones and 61% of them have smartphones. This is a remarkable change from even two years ago. More than half of the people you see every day are carrying a computer that dwarfs the most powerful computing technology that was available a decade ago. It’s also connected to all of the world’s information, literally at our fingertips. What do we use it for? Drawing moustaches on our selfies and tossing wingless birds at shoddily made pig housing. If you’d like to use your smartphone for more sophisticated purposes, plus add a ton of convenience and peace of mind to your life, consider mobile banking. With a couple of taps, you can access a whole suite of financial information. 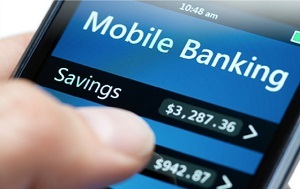 Let’s look at four scenarios where mobile banking can save you some time … and even some money. Despite all of the data breaches that have been in the public eye over the past few years, no one has figured out how to compromise mobile devices as a platform. Security leaks have affected PCs, Macs and point of sale terminals, but no widespread security vulnerability has compromised mobile banking. Despite the fear, mobile banking is actually a fundamentally secure platform. The first reason for this is the plurality of platforms. You and your neighbor may not be able to share cellphone chargers, much less apps or other experiences. This diversity makes it difficult for a single vulnerability to affect many users. Since there’s less possibility of large scale attacks, hackers have very little incentive to dedicate time toward trying to compromise mobile platforms. The second reason for this is the tight control placed on mobile devices. Because these devices have to send regular usage information back to your mobile provider, they tend to be far less prone to modification. There’s just not as much you can do to an iPhone or an Android as you can to a PC. While some users might override those protections, such modifications are not widespread enough to justify attempted infiltration. Mobile banking is secure and safe. Data transmitted from your cellphone to your provider is heavily encrypted. If you lose your phone, it can be remotely deactivated and passwords usually aren’t stored on the device. Rather than waiting for your statement every month or booting up that slow PC for checking your account balances online, you can view transactions while waiting for a bus or in line at a restaurant. You can stay vigilant against illegal account access any time you’ve got your phone and a spare few seconds. The convenience of mobile banking can also keep you from making costly mistakes. If you know funds may be running tight, check your account balance while in the checkout line to make sure you can cover the cost of your purchases. You can see if your monthly rent check has been withdrawn from your account to avoid the costly fees associated with overdrafting. It’s easier than ever to keep track of your finances. event errors with mobile banking. Accidental overpayment, duplicate payments and other errors are a regrettable reality of the modern high-speed economy. By regularly checking your account statement, you can catch these pesky problems before they turn into big issues. Mobile payments and mobile check depositing are becoming more widely available and are already being used in many places. As technology gets better, these functions will become cheaper, faster and even more widespread. Getting involved in mobile banking on the ground floor will help you stay up to speed with this rapidly evolving world. Imagine getting turn-by-turn walking directions to your nearest ATM. You could get alerts when new houses are listed for sale along your daily commute. You might pay for your breakfast by signing a receipt on your phone. These and other changes are coming and they are only the beginning. If mobile banking doesn’t do something you need, wait six months. Someone will probably find an app for that. Do you ever wake up in the middle of the night in a panic because you can’t remember if you paid your electric bill? Ever have a tiny freakout on the bus because you suspect someone may have accessed your account? Are money worries preventing you from enjoying your vacation? If you have these concerns and are nowhere near your computer, you could just suffer through them. As an alternative, though, you could use a mobile app to check your balance and transaction history. See if your monthly bills have cleared. Make sure your balance is safe. You can do all of this any time you’ve got your phone, day or night. Mobile banking won’t replace traditional, face-to-face interaction. There will always be a place in the credit union service standards for the human interaction. What mobile banking apps offer is a wonderful supplement to those high-quality services. Space-age convenience, top-level security, and blissful peace of mind are all available from your pocket, anywhere in the world.